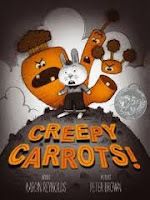 When I was halfway through my first reading of Creepy Carrots I was sure it could be a fun puppet show: Stick puppet carrots sneaking up behind rabbit...it would be great! But when Roscoe Rabbit builds a giant fence at the end I couldn't really figure out how to make it work, so I gave up the idea. A month or two later Sheila thought it would be just right for our summer Preschool Stories & Science program, with the "Dig Into Reading" theme and all. She figured it out: we could to act it out, add some volunteers from the audience, and fill in selected scenes with some scanned illustrations from the book. We decided to try it for our K-2 Book Adventure Summer Reading preview, which also used "Dig Into Reading." 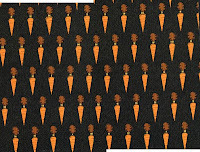 For Roscoe's carrot field, we projected the illustration from the book on the screen, then had a table covered with brown butcher paper at the bottom of the screen, sort of extending it into 3-d. And we sprinkled a bunch of real carrots in there, so Sheila could hop past, stop, and take a bunch. 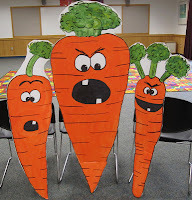 When it came time for the Creepy Carrots to appear, Terri led the kids in the refrain "tunktunktunk" and they just followed her, appearing from behind our backdrop, then ducking back just before Sheila turned around to see them. The kids rarely stayed all the way hidden, but that was fine. 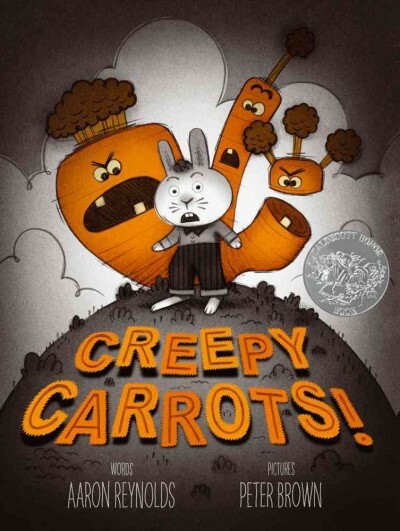 Then as she decides with relief that "creepy carrots aren't real," we did a "grow" animation click so they got even bigger. 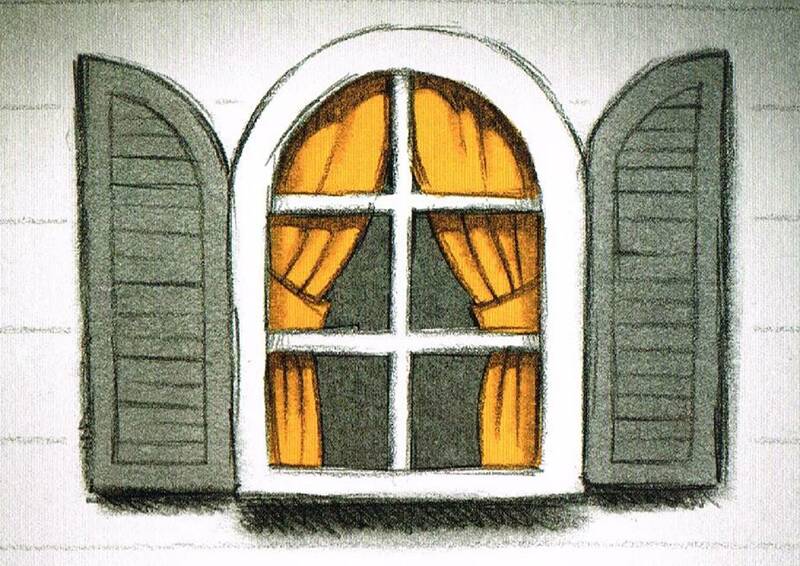 We put the next window scene, which is on the opposite page of the book, "underneath" the first illustration, then had one "fade out" while the other "faded in," using PowerPoint animation effects again. 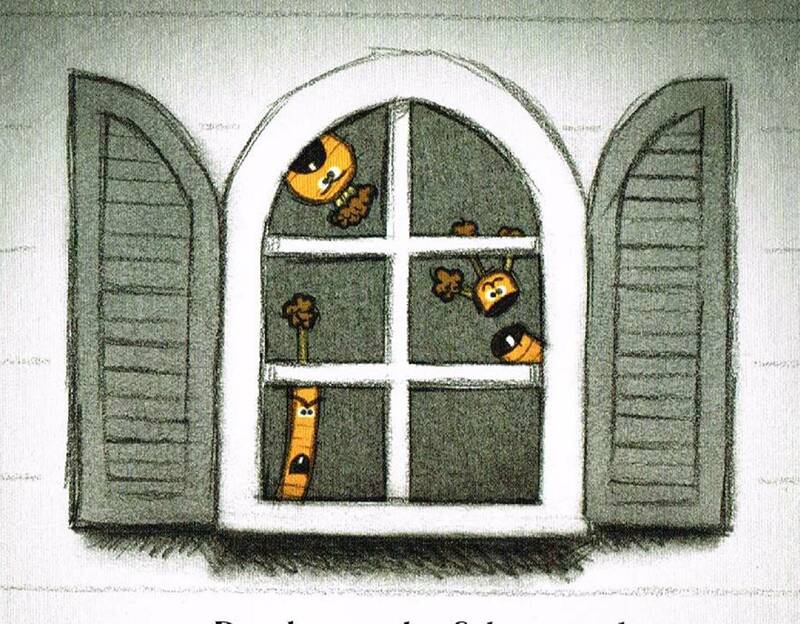 And as the non-carrot window appeared, the live carrots snuck back behind the backdrop. In the end Roscoe builds a fortress around the carrot field so they can't get out. 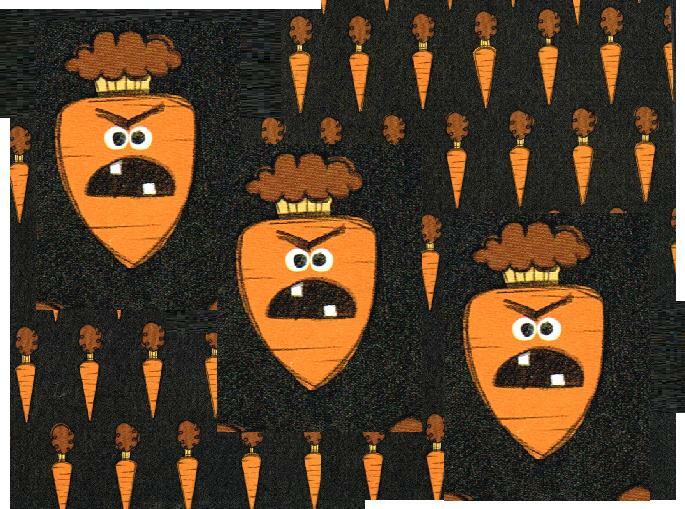 And it's exactly what the Creepy Carrots were hoping for, since now he can't get in to pick them. 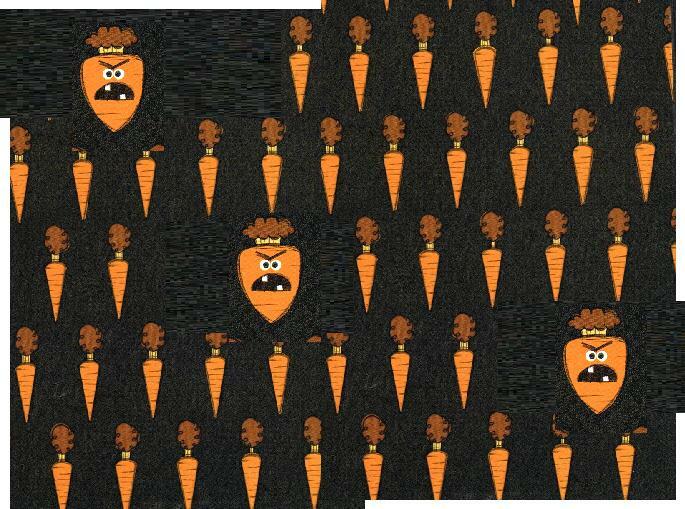 For this, we showed the scan of Roscoe's fortress, then the scene of the celebrating carrots, and had our three live carrots come out and celebrate too. Much better than whatever I might have come up with for a puppet show. Overall, the combination of screen and act out worked well. 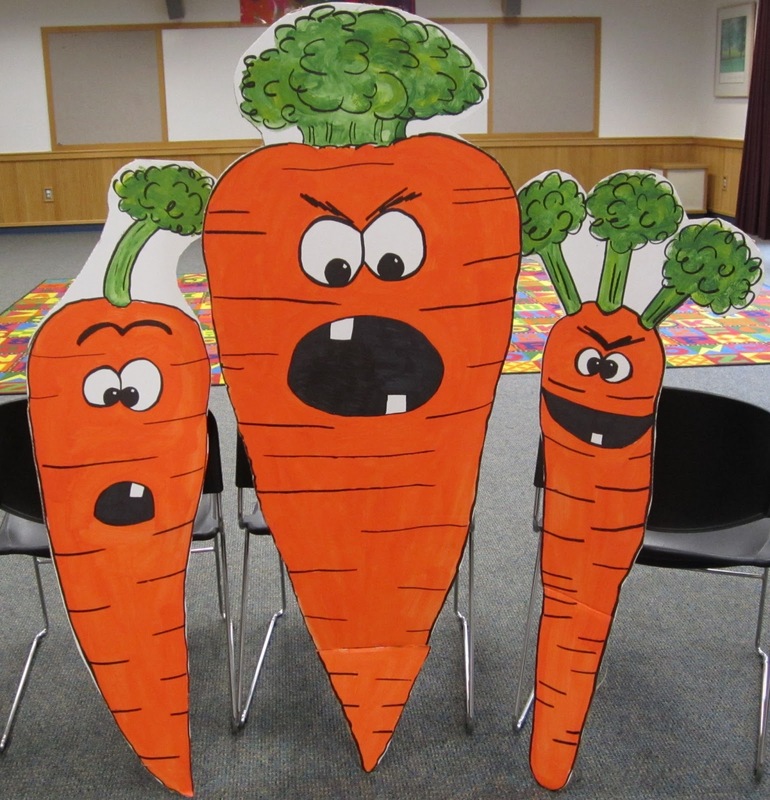 While the scans on the screen let us share the excellent illustrations, it was the three cardboard carrots interacting with Roscoe that really made it come alive for the audience. The one disappointing piece was the lighting. The orange coloring on the book and on the computer screen has a great glowi-ness to it, but that only shows up on screen when it's dark in the room...and we needed enough light to see the acting out guys. We found a middle ground that worked well enough, though. K-2 Book Adventure Program Summary - "Dig Into Reading"
We just finished our last "K-2 Book Adventure" of the school year and I realize I haven't posted any program summaries...maybe I'll catch up soon. For May we made it kind of a sneak preview of our Summer Reading Program, so we used the "Dig Into Reading" theme. Not the easiest topic for this program, but I think we made it work, picking five books that each have something to do with guys who dig. 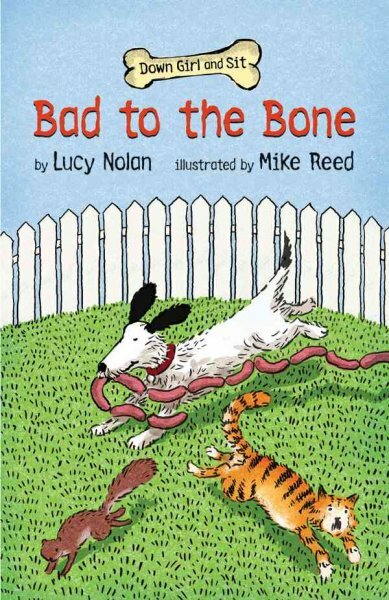 We started with "Digging Dogs," and acted out a scene from one of my favorite early chapter book series: "Down Girl and Sit" by Lucy Nolan. Those books just crack me up; they're perfect for people who like dogs and who have a 2nd grade sense of humor, so no wonder. Though Down Girl and Sit do some digging in their books, we chose two funnier scenes to act out, both from Bad to the Bone. As "Ruff" (Down Girl's owner) I tell how Down Girl and Sit got their names, while Terri and Sheila (as DG and S) demonstrate by jumping up and down and not sitting. Then we did a scene where Down Girl drags her newly cleaned rug through the mud, so it will smell right again. Some good chasing there as the neighbor cat, Here Kitty Kitty, clings to the rug while Terri/Down Girl runs into the audience with the puppet cat trailing. We finished with the scene where the dogs grab Ruff's paint brush and get paint all over him ("now he will match the color of the house!") and eat Ruff's pizza. The scene has a nice conclusion where Ruff decides Down Girl needs to go to dog training classes, and DG thinks it's a good idea because "Ruff has a lot to learn." 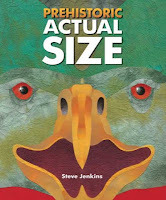 Then we shifted to "Digging for Dinosaurs," featuring Prehistoric Actual Size by Steve Jenkins. For whole animal and projected them large on the screen, with a note on how close these are to actual size. Next up was "Digging Worms," and we took the easy way out for this one. 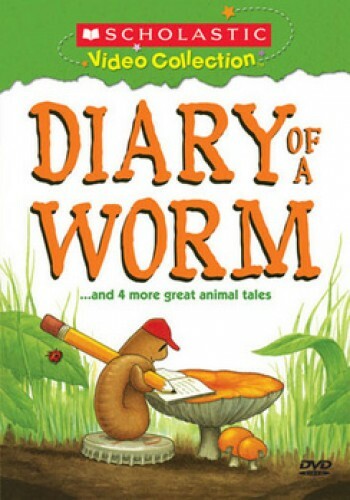 I just love the "Diary" books by Doreen Cronin and Harry Bliss, but could not think of anything we could do with Diary of a Worm that would be as good as the excellent Weston Woods film. So we showed that on the screen. 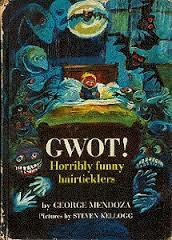 George Mendoza. The book is long out of print (published in 1967, now $70+ on amazon), but I haven't had the chance to tell that story in a long time and decided I'd just take the opportunity. Basically a farmer slices a snake in two and it comes back the next day twice as big and that keeps happening...I know, sounds kind of weird, but it really is a great oral tale, just funny enough and just gross enough. Plus it works as a "stretch" if you have the kids stand up and "Thwack!" the snake each time. 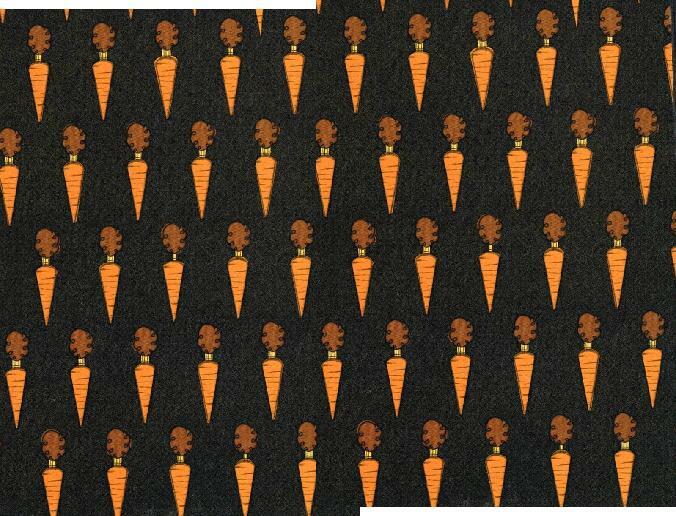 We were planning on finishing with "Digging Rabbits" and using Tops and Bottoms by Janet Stevens. But a week or so before the event Sheila decided we just had to find a way to do Creepy Carrots, a recent Caldecott Honor book by Peter Brown. We've been really busy and Tops and Bottoms was going to be easy since we had done it before, but sometimes the lure of a cool new book is just too hard to resist....so this became our "Digging Rabbits" book instead. Details are in this separate post. 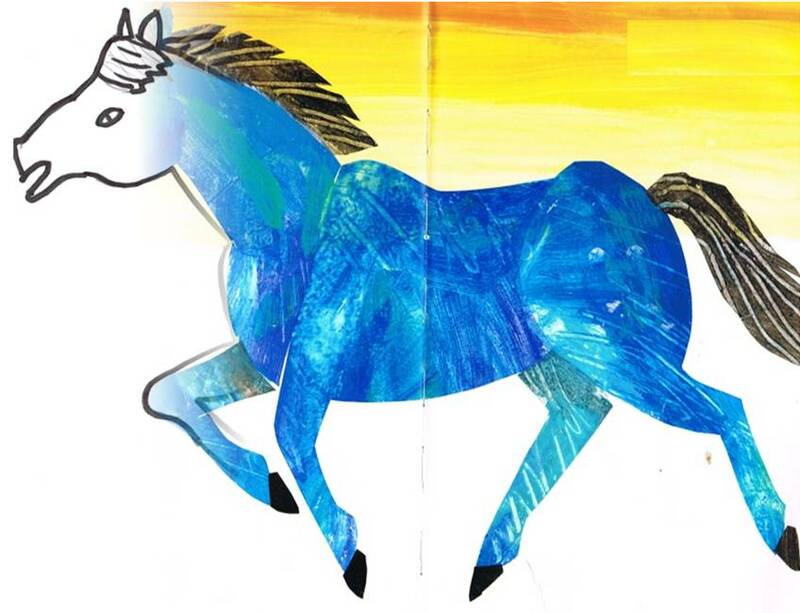 We did an "Eric Carle" themed storytime recently. 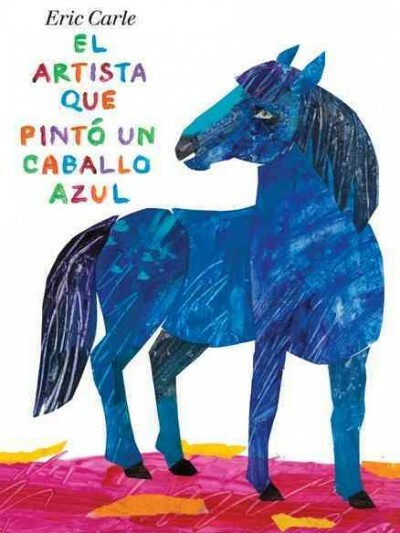 Sheila's been taking Spanish classes and this seemed like a good story to do in both languages. And since Carle's illustrations are so excellent and our crowds are too big to use the book, we did the scan and project thing, using some simple PowerPoint animation to add a bit of visual surprise. We traced each animal on white paper and scanned that picture. 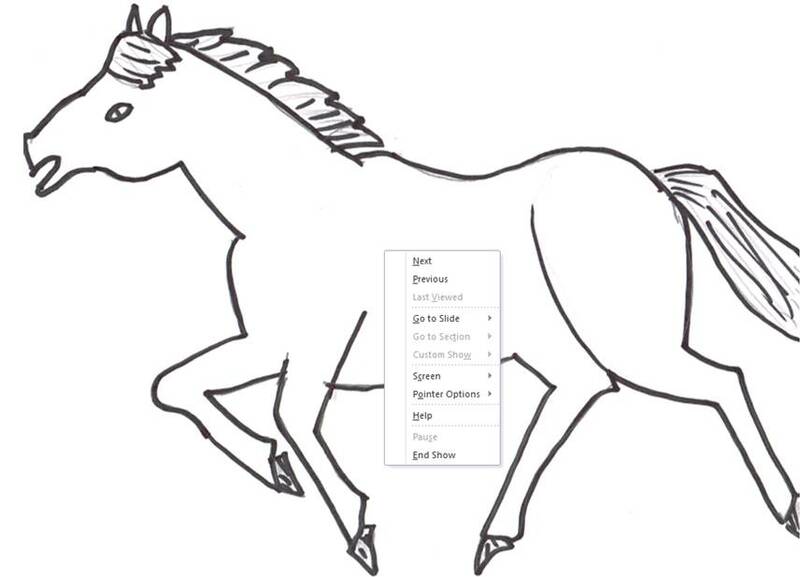 (We didn't scan the little window in the middle of the horse...that's me messing up on my copying and pasting). 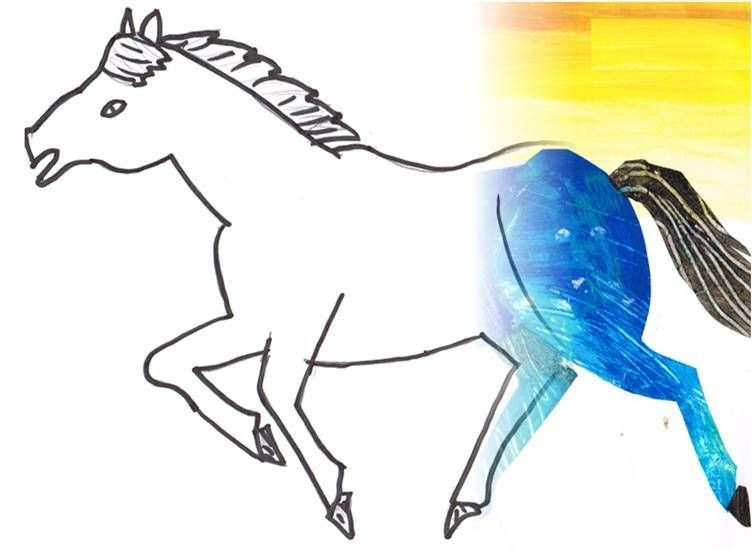 Then we scanned the illustration from the book and line that up exactly even with the outline. 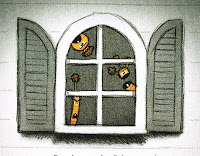 Then you do Animation / Appear / Fly In for the colored illustration. If it "flies in" from right to left, and you set the time for a good 6 seconds, it looks like the outline is getting slowly filled by the colors. 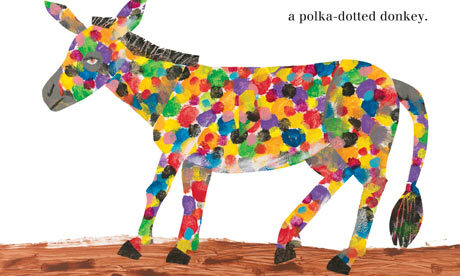 So to tell the story, we'd show the outline, then I'd say "I wonder what color the artist is going to paint this animal?" Sheila steps up with her artist clothes and a broom (to act as a giant paintbrush) and strokes along the screen as the color fills the animal. So it kind of looks like she's painting it. 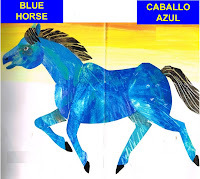 When the animal is filled in, I say the English words ("Blue Horse") and Sheila says the Spanish ones ("Caballo Azul") as the written words for both appear above the animals. Simple to tell, and lots of fun. I acted surprised the first few times the Artist painted an animal an unusual color, but then added comments like "I've never seen an orange lion before...but I love it!" We do enough stories where getting something wrong is a joke, and we wanted to be sure the kids got the point that the colors the Artist chose were imaginative and creative, not "wrong" at all.